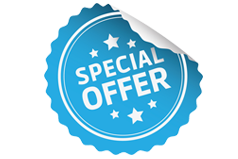 Hospitality Printer is offering our customers an exclusive deal on Rack cards. You can get 1000 full-color 4x9 UV coated Rack cards for just $95.00 - our gift to you! That’s right! For less than $100.00 you can order your Rack cards with us today to kick-start your business success. Our rich, detailed photos, logos and graphics will surely add a touch of professionalism to your Rack cards - a sure way to catch the eye of your reader. Let's face it! Regardless of how small a hotel or resort is, it absolutely must have a rack card as a fundamental for promoting the property. You just can't do without one. Don’t miss out on this great opportunity, order today to get your Rack Cards produced and take advantage of our low prices and quick turnaround! Call 954.781.7771 to speak to one of our Reps for more details.